A versatile source of heavier distortion with the practicality of two onstage levels. Won't do low-gain - but that's not the point! 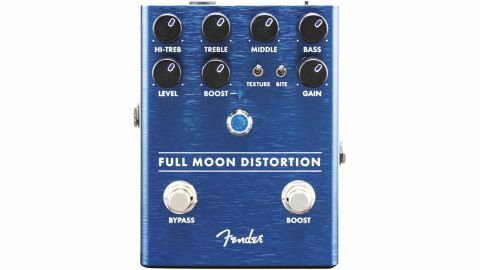 Fender says that the Full Moon Distortion is its first ever high-gain distortion and that’s exactly what it delivers running all-out, although it’s also capable of raunchy overdrive at lower gain settings. It’s a dual-footswitch pedal with up to 12dB of post-gain boost available with the second footswitch should you want to kick the volume up a notch. The basic voicing of the distortion is set by the Texture toggle switch, which selects between symmetrical and asymmetrical clipping (most apparent in the thickness of the midrange), while a top row of four knobs provides plenty of EQ’ing options. These include a nice interaction of Treble and Hi-Treb knobs - one adjusting the presence, the other tweaking the top-end sheen. In addition, a Bite switch delivers a shift in the upper midrange emphasis, which is great for bringing out more harmonics and pick attack.